George Glyde was born in Preston Plucknett in late 1796 or early 1797, the son of James Glyde (b 1767 and a partner in Yeovil Bank) and Mary née Watts (the daughter of Yeovil solicitor Samuel Watts the elder). George was baptised in Yeovil on 25 January 1797 and his baptism is recorded in the Nonconformist Register, shown below. 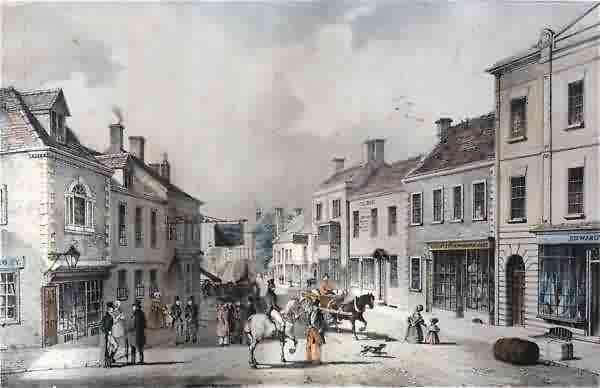 George became a dealer in china and glassware and, certainly by 1829, had shop premises in High Street, directly opposite the Mermaid Hotel, and is illustrated below. George clearly rented the premises and the owner put the property up for sale in 1829 giving a good description "Dwelling-House, commodious Front Shop, Store-rooms, and Offices attached, with a good garden, two comfortable Cottages, Stable, and Gig-house in South Street". Although described as ".... now in the occupation of Mr R Tucker, Mr G Glyde and others...", since George's name appears as signage on the property in the illustration below, it is likely that he rented the shop and accommodation over while Tucker and 'others' rented the cottages. George was recorded as the occupier in the 1841 census. It may also be that George bought the premises since in the 1846 Poll Book he is recorded by virtue of being the owner of a freehold house in the Borough (the name being frequently applied to High Street at this time). On 25 December 1832 George married Susanna Winsor at St John's church, Yeovil (marriages were not authorised in nonconformist churches at this time). Their marriage being noted in the 12 January 1833 edition of the Western Times. In the 1841 census George and Susanna (recorded as Susan) were listed living above the shop premises in High Street, together with a female servant. George was recorded as a China and Glass Dealer of High Street in Robson's Directory of 1839, with a similar listing in Pigot's Directory of 1842. 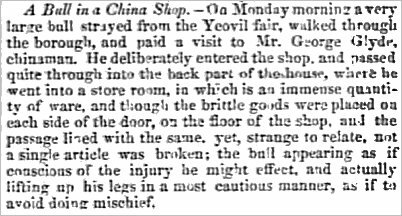 In 1844 an event happened in George's shop that was reported in many newspapers around the country entitled A Bull in a China Shop - "On Monday morning a very large bull strayed from the Yeovil fair, walked through the borough, and paid a visit to Mr George Glyde, chinaman. He deliberately entered the shop and passed quite through into the back part of the house, where he went into a store room, in which is an immense quantity of ware, and though the brittle goods were placed on each side of the door, on the floor of the shop, and the passage lined with the same yet, strange to relate, not a single article was broken; the bull appearing as if conscious of the injury he might effect, and actually lifting up his legs in a most cautious manner, as if to avoid doing mischief." Although, as mentioned above, George was recorded in the 1846 Poll Book, by the time of the 1851 census the shop had become the grocery of William Booby. I could find no further trace of George or Susanna Glyde in the records. The entry of George Glyde's baptism of 25 January 1797 in the Nonconformist Register, showing him to be the son of James Glyde of Preston. On the opposite side of the road, to the right of the white three storey building with the two-storey projecting bay is George Glyde's china and glassware shop and his name is seen at high level. 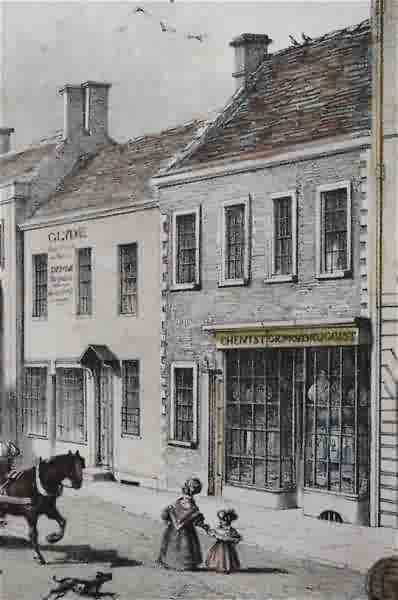 George Glyde's china and glassware shop (at left) enlarged from the lithograph above. At least from 1829, George clearly rented the premises and the owner put the property up for sale in 1829 giving a good description "Dwelling-House, commodious Front Shop, Store-rooms, and Offices attached, with a good garden, two comfortable Cottages, Stable, and Gig-house in South Street". Glyde remained in the building until 1846, when he was succeeded by Mr H Raymond. At the time of the lithograph this building was less than fifty years old, its predecessor being described by Daniel Vickery as "a low pent house, with a thatched roof". 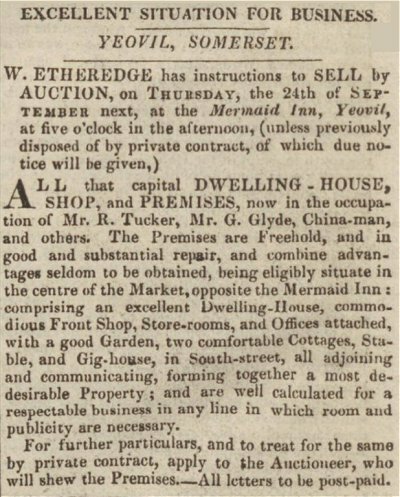 The notice of sale of the shop premises rented by George from the 31 August 1829 edition of the Sherborne Mercury. The 'Bull in a China Shop' report from the 6 July 1844 edition of the Sherborne Mercury. The story was published in newspapers around the country.